The CPMR Intermediterranean Commission (IMC) has stated that Regions have a key role to play in rebuilding the European Union and developing a better Europe, and Mediterranean, for citizens. The IMC, which brings together political representatives from 44 Regions in the Mediterranean, held its General Assembly in Venice, Italy. As well as its Member Regions, the Commission brought together representatives of the European Commission (DG REGIO and MARE), the Union of the Mediterranean (UfM) and a wide range of external partners, including Mediterranean operation programmes, in the Veneto Region. Debate during the meeting focused on key issues including Security and Migration, Neighbourhood Policy and Territorial Integrated Development, EU Cohesion Policy, Growth and Maritime priorities for the emerging strategies and initiatives in the EU and MED areas (e.g. EUSAIR and West Med), and Climate Change related issues (e.g. MED Cop 22, water and energy etc.). At the meeting, Apostolos Katsifaras, President of the West Greece Region, was elected as the new President of the Intermediterranean Commission, stressing the importance of Regional unity and coordination, and commitment to long-term strategic projects. A new Political Bureau was also elected, including four vice-presidents. Regarding Security and Migration challenges, IMC members reiterated their solidarity with the citizens of all countries hit by terrorist attacks and the millions of people forced to feel from war, terror, dictatorship and extreme poverty. They expressed in particular their deepest condolences to the families of those people murdered in Istanbul. 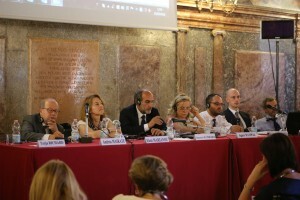 They noted that the migration issue is far being from solved and called again for the EU and national institutions to look at long term strategic and multilevel processes to receive and integrate migrants, more efficient management of migration flows, and the gradual adaptation to these pressing issues of territorial cooperation programmes operating in the Mediterranean and the future EU Cohesion policy. Speaking at the Assembly, Roberto Ciambetti, President of the Veneto Regional Council, explained that this was a meeting of “extraordinary importance“, offering a wide range of questions about how the European project should continue given the UK’s decision to leave the EU, the current economic crisis, and other events that have upset the geopolitical balance of the Mediterranean such as the threat of terrorism and the Arab Spring. Regarding Cohesion Policy, CPMR Secretary General, Eleni Marianou, said that the latest regional development statistics show rising levels of disparities between regions in Europe, with many regions in the Mediterranean falling behind the European average. IMC members warned that the European Fund for Strategic Investment will leave some EU territories behind, and called for stronger support from the EU Cohesion Policy to tackle regional disparities in the post-2020 period. In addition, IMC members acknowledged that the most relevant challenges and opportunities concerning the maritime sphere are the reduction of environmental pressures, the fight against climate change and the balanced development of land-sea interactions. They also highlighted the need for consolidation of the role of Regions in the promotion of all Blue Growth sectors and the implementation of planning instruments as Maritime Spatial Planning and Integrated Coastal Zone Management. Based on these needs, in May 2016 the CPMR IMC was accepted as a permanent observer by the Working Group on Blue Economy of the Union for the Mediterranean. The IMC will support the UfM cooperation on these issues for the whole of the Mediterranean, bringing its regional and maritime expertise by supporting initiatives such as the Bologna Charter on the sustainable development of coastal areas, or the joint CPMR work on maritime investments. Finally, the General Assembly also offered the IMC the opportunity to strengthen its relationships with other important networks, such as MedCities (with the signing of a specific Memorandum of Understanding). A complete report outlining the last mandate was also drawn up, containing the many activities and results achieved by the organisation and the 21 future cooperation projects already in the pipeline. These projects represent EU funding requirements of more than 20 million euros by CPMR IMC regions and consortia members. A short report for the Italian television (RAI) is available on Youtube.